How would you like to cut your grocery bill? Meal planning is by far the #1 way I save money on groceries. I can NOT stress that enough. So I’ll say it again. 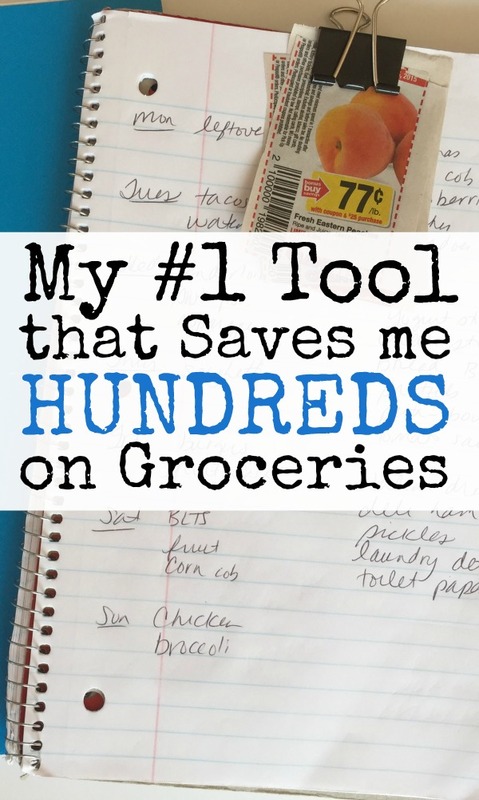 And there is one tool that I use that makes meal planning very easy. I’ve tried countless other options, but I always go back to basics, and this one simple tool has helped me save hundreds of dollars over the years. It’s mind blowing….Well, not really, but it is very effective. Yep, doesn’t that rock your world. This simple spiral notebook is what I use to plan our meals and my shopping list. When I take it with me to the grocery store, I stay on task. When I leave it at home, I have no plan for my trip and no doubt my budget will be blown. I use one page per week and on the left side of the page, I list the days of the week and write down my meal ideas. I use the right side of the page for my grocery list. 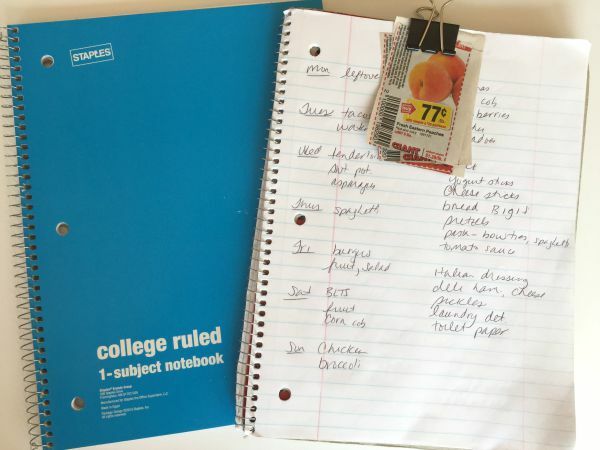 I use a binder clip to hold any coupons for my grocery trip, and take a pen with me to take notes and cross items off my list. And that’s it, folks! I know there are some pretty printables available on the web, but I’ve found a simple spiral notebook works so easily. When I am diligent about using the notebook for meal planning, my grocery bill stays within my budget. Good News! 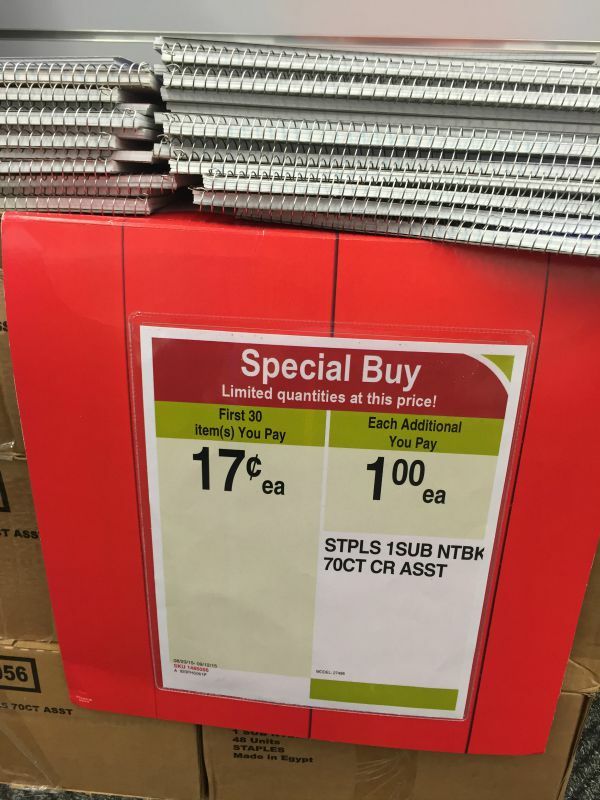 During back to school season, I’ve seen these spiral notebooks on sale for 17 cents at Staples. 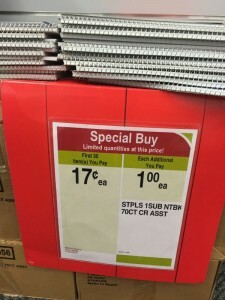 Although they’re only about $1 at regular price, or you might have one lying around your house. I love that your pantry doors are dry erase. That’s a great use for the space. Thanks for stopping by, Jean! We write right on the fridge door with dry erase marker it comes right off with a dry cloth or some rubbing alcohol for certain colors. That’s a great idea. We have an old fridge and the surface has a texture, so I don’t know if I could do so, but I like the idea of making it public for the family to see.